Reading back those keynote speakers notes again recently it’s incredible to think that that presentation was only 10 years ago. Apps and the way we interact with them have become so intertwined in our everyday lives that it seems like they’ve been around for a 100 years, not 10! Checking bank balances, liking and unliking photos, booking flights, arranging blind dates, chasing Pokémon around a park and even sharing pics of our food have all become second nature to us and as an Apple fan or not you cannot deny that the launch of the App Store was and still is largely responsible for a seismic shift in how we access the world via our mobile phones. Over the last decade apps have transformed from informational to transactional to experiential and there’s no better place to see this evolution than within the travel industry so to mark this momentous 10 year anniversary we’re going to go back, way back… to where it all began and remember what the first travel apps looked like (including our own). Before we celebrate this mobile milestone it’s also worth quickly noting that our app history could have been very different. Remember in 2007 when Apple first starting asking developers to develop for the iPhone?, Steve Jobs’ original vision for the iPhone didn’t even include the idea of third party apps, instead it was supposed to be WebApps for Safari! However putting that almost misstep to one side the past ten years have witnessed mind blowingly uptake in terms of app usage and engagement with the number of iOS apps available shooting from just 3,000 in September 2008 a few months after launch to over 2 million today. The first weekend alone saw over 10 million downloads and just 3 months later there were more than 100 million downloads worldwide. And uptake certainly hasn’t slowed down since. Last year alone there were 175 billion downloads of apps across the major app stores with the average smartphone user engaging with close to 40 apps a month. Consumer spend on apps in 2017 was in excess of $86 billion (a 105% increase from 2015), highlighting just how willing people are to let apps transform their lives. Prior to the launch of the App Store airlines and travel brands had obviously starting looking at mobile, but before apps it was a very slow (both technically and metaphorically) journey. In 1999 Swissair introduced a WAP mobile check-in experience, followed a few years later by British Airways and American Airlines. However throughout the early and mid 2000s progress was almost non-existent, with the exception of a few highlights such as Lufthansa offering SMS check-in, Yatra providing flight search and booking via their WAP site, Kayak allowing flight, hotel and restaurant search and Continental (now United) Airlines accepting mobile boarding passes on BlackBerrys in 2007. Post the App Store launch, British Airlines was one of the first travel brands with an iPhone app in 2008. Despite it being more or less a clone of the WAP site, with just arrivals and departure information, timetables and a link to a full site, it clearly marked the beginning of a brand new era of mobile travel. Others quickly followed suit with the likes of Lufthansa, TripIt, Hilton Hotels, Orbitz, Kayak, United, Delta, Air France, Best Western and American Airlines all introducing their own apps throughout the late 2000s. Functionality wise, you can see the shifts in the sand over the last 10 years as airlines and travel brands found their feet on this new platform. From 2008 - 2010 it was very much about getting the basics right - My Flights, Check-In and Flight Status became the building blocks of every airlines mobile strategy. From 2010 more building blocks were added as search and booking were introduced. This basic functionality may seem trivial today but it can’t be underestimated how much of a step change from the user experience of booking on a WAP site to now booking via a native app flow had at the time. Revolutionary is an overused word when talking about Apple but native booking really was that, it changed the mobile game. Another shift occurred in 2012 when Apple introduced Passbook. 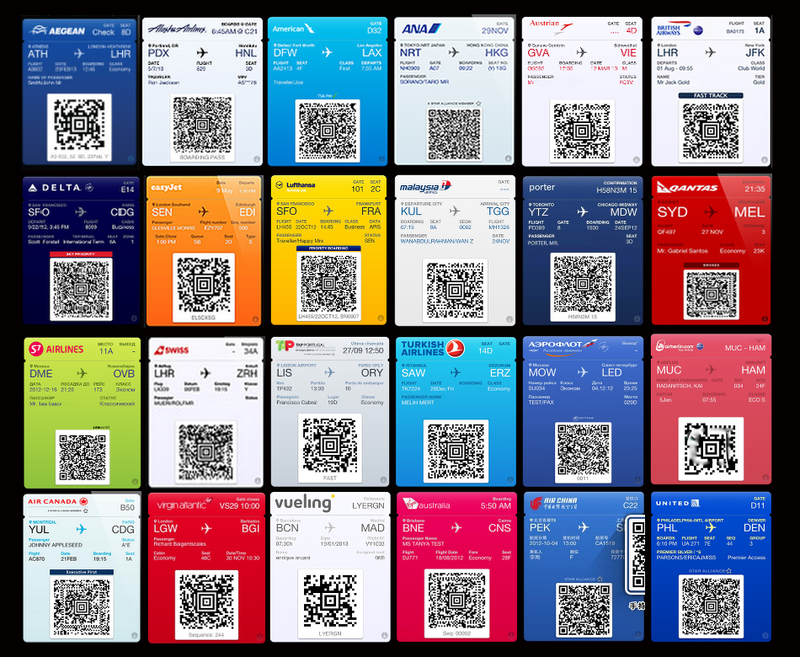 Although Apple didn’t invent the mobile boarding passes, they had been around for years (usually by saving a barcode image on your phone), it was Passbook that overhauled the user experience and brought location and time into the check-in journey for the first time ever with boarding passes appearing on the homescreen as you got near the airport on day of travel. 2013 and 2014 were the years of mobile friction removers with the introduction of functionality like passport and credit card scanning, automatic field filling and saving of multiple passenger details within apps. In recent years the focus of airline and travel apps has been around extending touchpoints, encouraging traveller engagement, increased personalisation and proactive assistance. Today’s travel apps bear very little resemblance to those that first emerged a decade ago, as the example screens from easyJet’s iPhone app in 2011 and 2018 depict. Not only have the features, design and usability greatly advanced, but the role of the app for airlines and travel brands has also shifted. While a few years ago an app was viewed as a ‘nice to have’ or a complimentary channel, today many travel brands are mobile first with their app the go-to channel for engagement. Ryanair for instance recently reported that in some countries there are more visits to the app than the website, proving once again just how far mobile apps have come in the last 10 years. In 2017 travel was ranked the 9th most popular category in the App Store for downloads (up 3 places from 2016), illustrating the growing demand for managing and booking travel through apps. No look back at the history of the App Store would be complete without a look at our own history. Travelport Digital has been at the forefront of mobile engagement since 2005 so we were helping travel brands reach their users on mobile before both the iPhone and it’s store existed at all. Silverjet, Jetstar, Air Asia are just a few of the really early mobile movers that we worked before the App Store launched in 2008. easyJet were there too with a mobile web disruption portal developed by us in 2010, which although may not sound impressive now, was incredibly groundbreaking for the time. Imagine being able to change your cancelled flight on your phone! Fast forward to 2011 and we launched our first true native mobile app in the App Store for easyJet which quickly gained recognition for being the fastest airline booking app in the world, enabling passengers to book a flight on more than 580 routes in less than 30 seconds. A year later the app had already reached the 1 million downloads mark. 6 and ½ years later the app has been downloaded over 26 million times (iOS and Android). Transavia’s iPhone app was the next to go live in 2013 followed by BCD TripSource and LATAM Airlines in 2014, multi-device apps for Singapore Airlines in 2015 and many more have followed in recent years including Etihad Airways, Copa Airlines, Fiji Airways, XL Travel, Maxims Travel and Collinson Group. Since those early days of the App Store our customers’ mobile apps have significantly evolved to allow travellers seamlessly manage all aspects of their trip, from booking in-destination activities and ordering taxis to changing flights, adding extras, booking hotels, navigating unknown cities and airports, managing the IFE experience and tracking their loyalty all from within the apps - on their mobiles, tablets and their wrists. The App Store went live 10 years ago and since then our customers’ iPhone apps have had over 40 million downloads to date! Games and apps are now split out. New ‘today’ tab used by Apple as a daily driver to engage users. It features up to 7 days’ worth of content including new apps, games, original editorial content, videos, and promotions. Introduction of 12 different editorial cards to highlight and promote certain apps, including ‘App of the Day’. Various updates to the App Product Page such as a new 30 character ‘subtitle’ field, extension of app previews to 3 per language, new ‘promo’ text above the description that can be changed at any time and lots of other smaller changes. App titles, subtitles, developers, editorial content and even categories are now all searchable. Overall, the redesign lead to more ways for apps to be promoted and featured by Apple including App of the Day, Meet the Developer, App Collections, Hero (featured app), Daily List and Editor’s Choice. So now that we’ve taken a nostalgic look back at the past ten years of the App Store, what do the next ten look like? With downloads across the app stores increasing by 60% between 2015 and 2017, it’s highly likely that growth of the app economy will continue full steam ahead. In the past few years there has been much fevered talk around concepts like ‘apps are dead’ and ‘app fatigue’. While it’s clear that in the more mature markets such as the US and Europe downloads have naturally slowed, growth is still very much apparent. In 2017 over 70% of US smartphone owners downloaded at least one app per month and total sessions in travel apps increased by 55% between 2015 and 2017 in the US. Exponential growth is currently very much evident in the emerging markets such as the BRIC countries and in the coming years it’s expected we’ll witness similar patterns in less developed regions such as Africa. Where does the future for Apple and iOS lie? To find out what exactly iOS12 will bring, it's values and benefits, specifically for the travel industry check out our handy 21 slide deck.